Executive Order 13149 requires that government agencies leasing or owning 20 or more motor vehicles must report detailed fleet information into the Federal Automotive Statistical Tool (FAST). The Sunflower FAST Reporting solution automates FAST reports for organizations managing their motor vehicles within Sunflower Assets®. 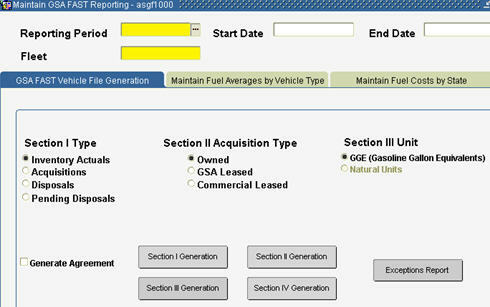 Users record information in Sunflower about their use of vehicles and Sunflower generates an Excel file that users then upload into the GSA FAST reporting system. Sunflower Systems provides leading enterprise asset management solutions. Sunflower simplifies enterprise asset management tasks including asset management, personal property management, real property management, contract property management, configuration management, lifecycle asset management, government property management, weapons management, law enforcement asset management, entertainment asset management, and more. Our asset management services and enterprise asset management software applies to all industries. Contact us for information on the industry’s best enterprise asset management system. Sunflower Systems - Where enterprise asset management meets lifecycle asset management and everything in between.